Figure 1: Note that the six-year molars (see arrows) are positioned “Angle Class I”. From the photograph, the patient’s main occlusal problem appears to be crowding; the upper jaw appears “constricted” (narrowed), and the upper front teeth are flared forward a bit. An evaluation of the jaw and facial bones using a cephalometric X-ray image is necessary to rule out a skeletal malocclusion. (Image courtesy Thomas J. Melcher, DDS, MS). Malocclusion is the dental term for an improper bite relationship between the upper and lower teeth (Figure 1). In some cases, the misalignment is due to a size or positional mismatch between the jaw bones (the maxilla and mandible), and in some, it is the size or position of the teeth within the jawbones. Combinations are also possible. When the jawbones are mismatched, the condition is called a “skeletal malocclusion” (Figure 2). When the malocclusion is due to tooth size and position issues, the condition is called a “dentoalveolar malocclusion”. 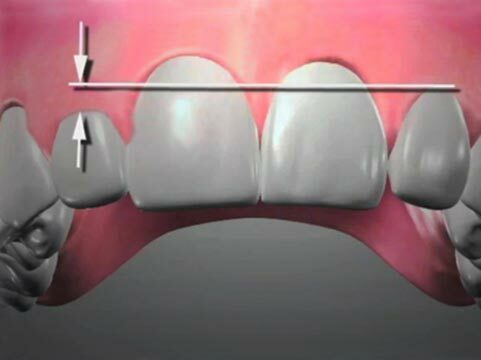 Dentists use a system called “Angle Classification” to describe the relative closed-bite positions of the upper and lower first permanent molars and canines (measured forward-backward along the dental arches). The first permanent molars appear in the mouth around age six, and are an important determinant of how the patient’s overall bite relationship will develop. Angle Class I is considered to be normal position (with the forward, outermost “mesiobuccal” cusp of the upper six-year molar resting in the “Buccal” groove of the lower six-year molar, between its cusps); Angle Class II is where the lower molars are positioned distal (toward the back of the mouth) of Class I position; Angle Class III is where the lower molars are positioned mesial (toward the front of the mouth) of Class I position. Malocclusion ranges in severity from slightly tipped or rotated individual teeth, to poorly matched jaw bones, with undersized dental arches and oversized, crowded teeth. 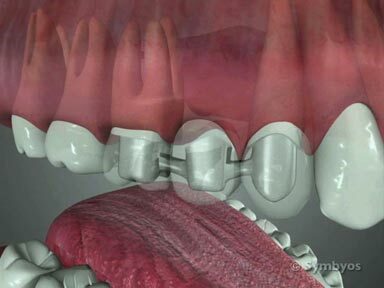 Depending on the severity of the patient’s malocclusion, significant problems can occur. These include abnormal wear (attrition), chipping /cracking, and premature loss of teeth; reduced chewing efficiency; improper nutrition; jaw joint pain, popping, clicking and/or locking (TMJ Disorders); reduced ability to perform effective oral hygiene; development of tooth decay (caries); development of periodontal disease; and what some may view as an unattractive smile. Figure 2: This patient has a severe skeletal malocclusion (prognathic, oversized mandible, combined with an undersized maxilla), which would require a combination of orthognathic surgery and orthodontic treatment to correct. Unfortunately, the condition contributed to the premature loss of the patient’s lower front teeth (those shown in the photograph are denture teeth). Terms used to describe positional features include “prognathic”, “retrognathic”, “overjet”, and “overbite”. Prognathic means one (or both) of the jaw bones is positioned too far forward (Figure 2). Maxillary prognathism means the upper jaw is positioned too far forward for the teeth to align properly. This condition also gives the face too much convexity when the patient is viewed in profile. Retrognathic means one (or both) of the jaw bones is positioned too far backward. Mandibular retrognathism means the lower jaw is positioned too far back for the teeth to align properly. This has the some of the same effects on tooth alignment as maxillary prognathism. Overjet is the term used to describe the horizontal distance between the outer biting edges of the upper and lower teeth when the patient has their teeth fully closed. Normally this distance is about one to three millimeters, with the upper teeth sitting outside of the lowers. “Reverse overjet” or “underjet” is where the lower teeth sit outside the uppers when the patient closes fully together (Figure 2). Other terms used when the lower teeth close on the outside of the upper teeth include “crossbite”, and “reverse occlusion”. “Overbite” is the vertical distance between the upper incisor biting edges and lower incisor biting edges when the patient has their teeth fully closed. Normally, the upper incisors overlap (on the outside of) the lower incisors by about 50% of the height of the lower incisor crowns. “Underbite” is where the lowers incisors are positioned outside of the uppers when the patient is fully closed together. An “open bite” is where the upper and lower teeth do not make it as far as the closed bite plane, leaving the affected opposing teeth separated when the patient is biting together fully. Ideal position and size of the jaws for proper alignment of the dental arches can be influenced while growth and development of the patient is still occurring. The specialty of dentistry known as orthodontics involves diagnosing and treating various types of malocclusion, so that the patient’s teeth close together with even force distribution when the jaw muscles are relaxed and the jaw joints are in a stable position. Orthodontists try to accomplish these goals while achieving esthetic facial proportions and an attractive smile. How does the dentist diagnose Malocclusion? Figure 3: Dentists use diagnostic casts of the teeth for a variety of purposes when evaluating malocclusion. They can be used to evaluate how the teeth mesh. The additive widths of individual teeth can be measured to compare the space required to fit them all in the dental arch with the actual length of the dental arch. A “diagnostic equilibration” was performed on the casts in this photograph to see how much tooth structure would have to be removed to produce an evenly balanced bite relationship; and to decide whether orthodontic tooth movement and/or jaw surgery might be a better option. Dentists visually evaluate the way the teeth fit together as part of a comprehensive examination. They check for abnormal tooth position, crowding, jaw size discrepancies (i.e. one jaw poorly matched to the size of the other), abnormal wear (attrition), chips and cracks. If malocclusion is suspected, the dentist may prescribe impressions / casts of the teeth (Figure 3), and a series of facial X-ray images. Most commonly these include panoramic (Figure 4) and cephalometric (Figure 5) radiographs). Figure 4: Panoramic X-ray images are used to evaluate growth and development. Missing teeth can be identified, and measurements can be made of teeth which have not yet erupted to predict how much room will be needed in the dental arches for the permanent teeth. Unless the general dentist provides orthodontic treatment, a referral to an orthodontist may be made. Some general dentists provide limited orthodontic treatment for relatively simple orthodontics cases, but prefer to have the more complex patients treated by a specialist. Orthodontists are dentists who have completed two to three years of additional studies following graduation from dental school, and specialize in diagnosing and treating malocclusions and facial development issues. Figure 5: Cephalometric X-ray images are used to measure distances and angles in the developing face and jaw bones. Measurements are compared to “normal” growth and development numbers, and a treatment plan for guiding the growth and development of the face and jaw bones is established. (Image courtesy Thomas J. Melcher, DDS, MS). Evaluating children early for potential orthodontic issues is important. It is generally recommended that children be screened by an orthodontist around age seven. At this age, significant growth in the facial bones and jaws remains, and the patient generally has the permanent first molars and some of the permanent incisors. Lack of spaces between the primary teeth is a reasonably good predictor of crowding in the permanent teeth. If a child has an obvious underbite or prognathic mandible, or other obvious significant malocclusion, referral for orthodontic screening prior to age seven may be recommended. At this young age, the jaws and facial bones of children are flexible, and the upper jaw is still in two pieces (the left and right halves of the maxilla fuse around the time of puberty). Influencing the development of the jaws and face at an early age is generally straightforward. If malocclusion is suspected from a screening examination, casts of the teeth and radiographs (dental X-rays) are generally prescribed. Diagnostic photographs will also be taken. These diagnostic procedures are performed to produce records, which establish the patient’s starting point for treatment, a diagnosis, and the information needed to plan the best course of treatment. Orthodontic treatment is the most common recommendation for malocclusions. If there is a significant skeletal component to the malocclusion, a large skeletal asymmetry, or a skeletal deformity, maxillofacial surgery may recommended. Usually this will require the patient to undergo orthodontic treatment before, at the time of, and even after surgery is performed. If a patient is unable to undergo orthodontic treatment, it may be possible to adjust the way the teeth mesh in a procedure called occlusal adjustment. Limited occlusal adjustment may also be recommended to finely tune a patient’s occlusion (bite relationship) following orthodontic treatment. If teeth are undergoing rapid wear due to malocclusion, and orthdontic treatment is not an option, an occlusal guard may be recommended to decrease the wear rate of the teeth. Sometimes there is so much crowding in the dental arches that removal of one or more teeth may be recommended, either before orthodontic treatment is started, or while it is underway. It is common to have two to four bicuspid teeth removed, to create enough space for the other teeth in the dental arch. If a patient’s bite relationship is within normal limits, and the primary concern is crowded or rotated teeth, it may be possible to reconstruct the visible surfaces of the patient’s teeth to produce the illusion of proper alignment with veneers or onlays.